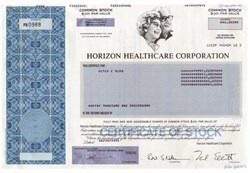 Beautifully engraved Certificate from the Horizon Healthcare Corporation issued in 1991. This historic document was printed by the Security Banknote Company and has an ornate block border with a vignette of an elderly couple. This item has the printed signatures of the company's officers including, Neal M. Elliott, Chairman of the Board. Neal M. Elliott, the Company's President, Chief Executive Officer and Chairman of the Board, has served in those capacities since July 1986. Mr. Elliott, a certified public accountant, worked for Price Waterhouse & Co. prior to joining The Hillhaven Corporation ("Hillhaven") as Controller in 1969. In 1970, Mr. Elliott became Vice President of Finance for Hillhaven and served as such until 1983. 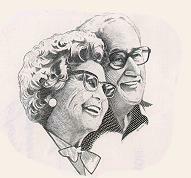 From 1983 to 1986, Mr. Elliott served as President of the long-term care group of National Medical Enterprises, Inc., a health care company then affiliated with Hillhaven. Mr. Elliott is a director of LTC Properties, Inc., a real estate investment trust which invests in health care related real estate. The Company is a leading provider of post-acute health care services, including specialty health care services and long-term care services, principally in the Midwest, Southwest, Northeast and Southeast regions of the United States. At May 31, 1996, Horizon provided specialty health care services through 37 acute rehabilitation hospitals in 16 states (2,065 beds), 58 specialty hospitals and subacute care units in 17 states (1,925 beds), 186 outpatient rehabilitation clinics in 22 states and 1,942 rehabilitation therapy contracts in 36 states. At that date, Horizon provided long-term care services through 120 owned or leased facilities (14,957 beds) and 142 managed facilities (15,894 beds) in a total of 18 states. Other medical services offered by the Company include pharmacy, laboratory, physician placement services, Alzheimer's care, physician management, non-invasive medical diagnostic, home respiratory, home infusion therapy and hospice care. For the year ended May 31, 1996, the Company derived 49% of its revenues from private sources, 33% from Medicare and 18% from Medicaid. Post-acute care is the provision of a continuum of care to patients for the twelve month period following discharge from an acute care hospital. Post-acute care services that the Company provides include: (a) inpatient and outpatient rehabilitative services; (b) subacute care; (c) long-term care; (d) contract rehabilitation therapy services; (e) home health care services; (f) pharmacy and related services; (g) clinical laboratory services; (h) physician placement services, (i) non-invasive medical diagnostic services; (j) home respiratory supplies and services; (k) home infusion supplies and services; (l) hospice care and (m) assisted living care. Horizon's integrated post-acute health care system is intended to provide continuity of care for its patients and enable payors to contract with one provider to provide for virtually all of the patient's needs during the period following discharge from an acute care facility. In addition, as corollaries to, and complements of, this integrated post-acute care delivery system are the Company's owned physician practice and its physician practice management services.